Update: Already fixed, it seems that one of VirtualHosts configurations files was wrong in sites-enabled. apache2: Could not reliably determine the server's fully qualified domain name, using 127.0.1.1 for ServerName (98)Address already in use: make_sock: could not bind to address 0.0.0.0:80 no listening sockets available, shutting down Unable to open logs Action 'start' failed. It doesn't kill it, if I run again the netstat command still appears listening and apache start fails. It may be skype or nginx using the port 80.
helped me indicate that Hiawatha webserver was in the way of Apache2. Removing Hiawatha fixed the issue (sudo dpkg --purge hiawatha). Ubuntu 12.04.2 server. For me, apache was already running but it was running the wrong way. Killing processes didnt work because a daemon kept reinstantiating it. Then I was able to restart Apache and everything was working fine. Go to device manager, select “show hidden devices” from menu/view, go to “Non-Plug and Play Driver”/HTTP, double click it to disable it (and disable or manual some services depended on it). Reboot and enjoy! and there aren't any mistyped directories or anything else that would not supposed to be in your .conf file. It did the trick for me as re-starting and killing the processes did not help at all. It did not start anyway. 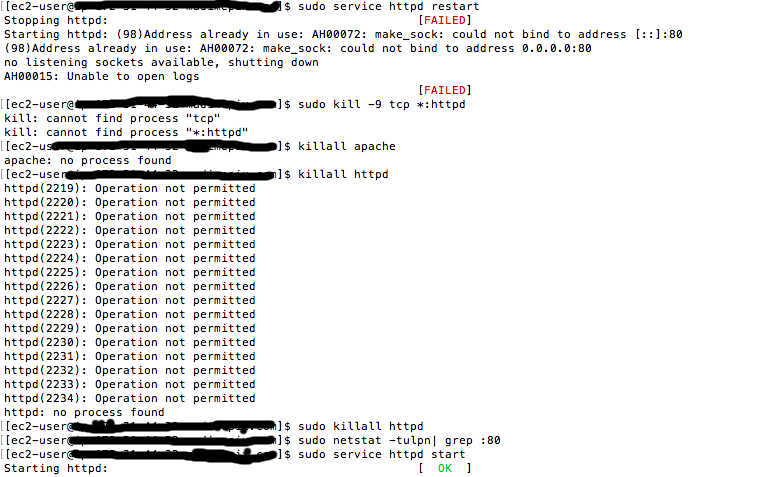 It look like other process is using port 80.
sudo lsof -i | grep "httpd"
I fixed it by using below procedure. Run below command as root user. It will show you Apache PID, just kill that PIDs and restart Apache Server. Not the answer you're looking for? Browse other questions tagged apache port kill netstat or ask your own question.